WASHINGTON/BEIRUT (Reuters) – The United States will likely end its air campaign against Islamic State in Syria when it pulls out troops, U.S. officials said, sealing an abrupt reversal of policy which has alarmed Western allies as well as Washington’s Kurdish battle partners. NATO allies France and Germany warned that Washington’s sudden change of course on Syria risks damaging the fight against Islamic State, and some of President Donald Trump’s fellow Republicans said the troop pullout strengthened Russia and Iran, which both support Syrian President Bashar al-Assad. Trump’s troop announcement on Wednesday upended a central pillar of American policy in the Middle East and stunned U.S. lawmakers and allies. France, a leading member of the U.S.-led coalition, said it would keep its troops in northern Syria for now because Islamic State militants had not been swept away. “Islamic State has not been wiped from the map nor have its roots. The last pockets of this terrorist organisation must be defeated militarily once and for all,” French Defence Minister Florence Parly said on Twitter. France has about 1,100 troops in Iraq and Syria providing logistics, training and heavy artillery support as well as fighter jets. In Syria it has dozens of special forces, military advisers and some foreign office personnel. Trump defended his decision on Thursday, tweeting that he was fulfilling a promise from his 2016 presidential campaign to leave Syria. The United States was doing the work of other countries with little in return and it was “time for others to finally fight,” he wrote. U.S. officials said Trump’s order to withdraw troops is also expected to mean an end to the U.S. air campaign against Islamic State in Syria, which has been critical to rolling back the militants there and in neighbouring Iraq, with more than 100,000 bombs and missiles fired at targets in the two countries since 2015. Still, one U.S. official cautioned that a final decision on the air campaign had not yet been made, and did not rule out some kind of support for partners and allies. France, for example, has said it will continue to fight in Syria. The United States told the U.N. Security Council it was committed to the “permanent destruction” of Islamic State in Syria and would keep pushing for the withdrawal of Iranian-backed forces in the country. 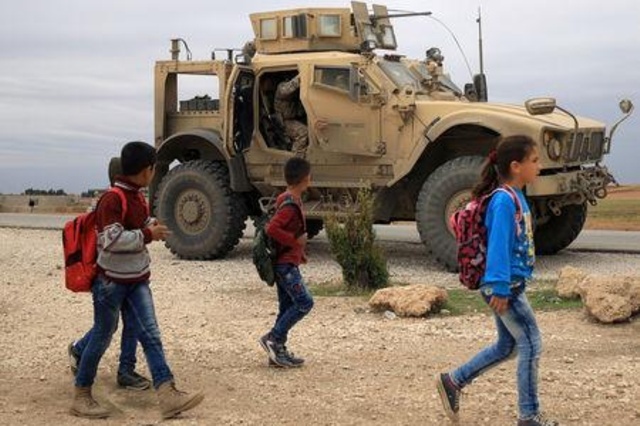 The roughly 2,000 U.S. troops in Syria, many of them special forces, were ostensibly helping to combat Islamic State but were also seen as a possible bulwark against Assad who has retaken much of Syria from his civil war foes with military help from Iran and Russia. U.S. officials, speaking on condition of anonymity, have told Reuters that U.S. commanders on the ground are concerned about the impact of a quick withdrawal and were surprised by the troop pullout decision. The Kurdish-led Syrian Democratic Forces (SDF), which have been fighting Islamic State with U.S. support for three years, said the withdrawal of troops would grant the militants breathing space to regroup at a critical stage in the conflict and leave Syrians stuck between “the claws of hostile parties” fighting for territory in the seven-year-old war. But they face the threat of a military incursion by Turkey, which considers the Kurdish YPG fighters who spearhead the force to be a terrorist group, and Syrian forces – backed by Russia and Iran – committed to restoring President Bashar al-Assad’s control over the whole country. The SDF said the battle against Islamic State had reached a decisive phase that required more support, not a precipitate U.S. withdrawal. A British junior defence minister said he disagreed with Trump. “(Islamic State) has morphed into other forms of extremism and the threat is very much alive,” Tobias Ellwood said.